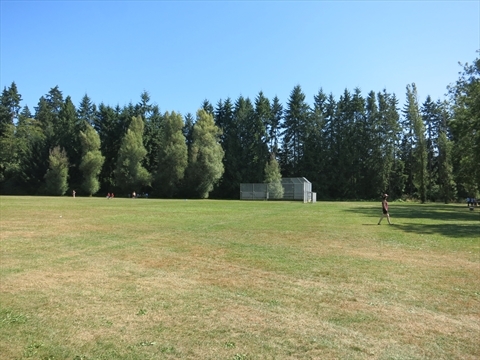 The Prospect Point Picnic Area is a large reservable picnic area with cooking facilities, washrooms, a baseball diamond. It is good for very large groups. There is some parking here. The drawback is that it is way out at Prospect Point so it is hard to access. There are no concessions here so you will have to bring in all your food and drinks or walk to Prospect Point where there is a concession. This picnic site accomodates up to 150 people. For amenities, it has a counter with sinks(but NO cooking appliances or fridge), 3 (15 amp) power outlets, a baseball diamond, hot coal disposal pit, and washrooms. There is a pay parking lot at this site and nearby is a stop of the Stanley Park Shuttle bus (summer only). The 2018 fee to reserve this picnic site for day(9am-4pm) or night(4pm to 9:30pm) is approximately $177. The city starts taking reservations for the 2018 season starting on February 5, 2018 at 11am. NOTE: You need to go to the City of Vancouver's web page here: Picnics in Vancouver's Parks to reserve your picnic spot. Note: If you have a group of more than 50 people you will need a permit from the city. 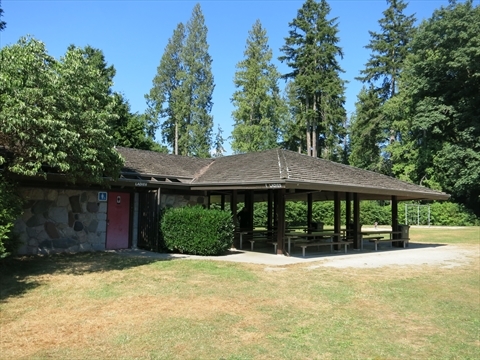 Where is Prospect Point Picnic Area in Stanley Park? The Prospect Point Picnic Area is located on the north side of Stanley Park just off of Stanley Park Drive about 100 metres past Prospect Point. Nearby is the Tree Donation Plaque. Prospect Point Lookout is a short walk away.